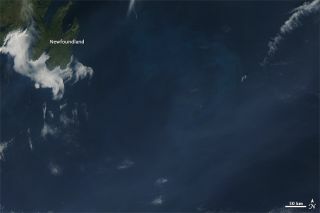 NASA's Aqua satellite took this image of smoke from wildfires in the northwest U.S. over the Atlantic on Sept. 19. "Smoke on the water" isn't just a famous song, but a truism in this season of bad wildfires. Besides torching forests and grasslands, wildfires throughout the northwest United States are also releasing a lot of smoke and particulate matter into the air. Some of it is even reached the Atlantic Ocean, as shown in this image obtained by NASA's Aqua satellite on Sept. 19. Smoke from fires in the Northwest has hurt air quality throughout the region and carried smoke throughout the country. In Washington, Oregon and Idaho, air quality ranged from unhealthy to hazardous, according to the Smog Blog at the University of Maryland. A light layer of smoke even wafted over Baltimore, the blog reported. This has been a continuing pattern in 2012, as wildfires have repeatedly reduced air quality around the country. It's been a bad year for wildfires, partially due to the intense drought gripping much of the country. If current rates continue, wildfires will burn more acres in 2012 than in any year since records began being kept in 1960. Wildfires raged in Colorado and throughout the Southwest earlier this summer, before shifting west and north. The Northwest is now the hardest hit area. As of today (Sept. 21), there are 24 large wildfires burning in the states of Washington, Montana and Idaho, according to the National Interagency Fire Center. In the entire country, there are 36 large fires in nine states. Together they've charred 13,360 square miles (34,600 square kilometers). That's above the 10-year average for this date, which is 10,208 square miles (26,440 square km).